Hoping you all had a great Christmas my friends and that Santa was most beneficent to you all. I actually received a pot of Marmite from my baby this Christmas. It was not my only gift from her. 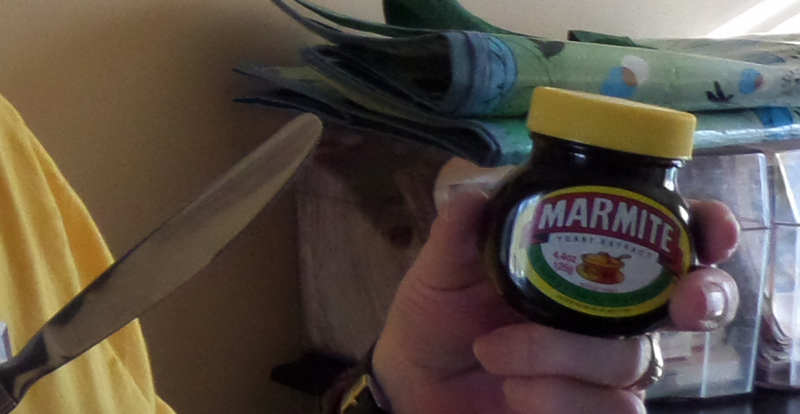 As usual she spent far too much on me but the Marmite was certainly the most unexpected of her many gifts to me. 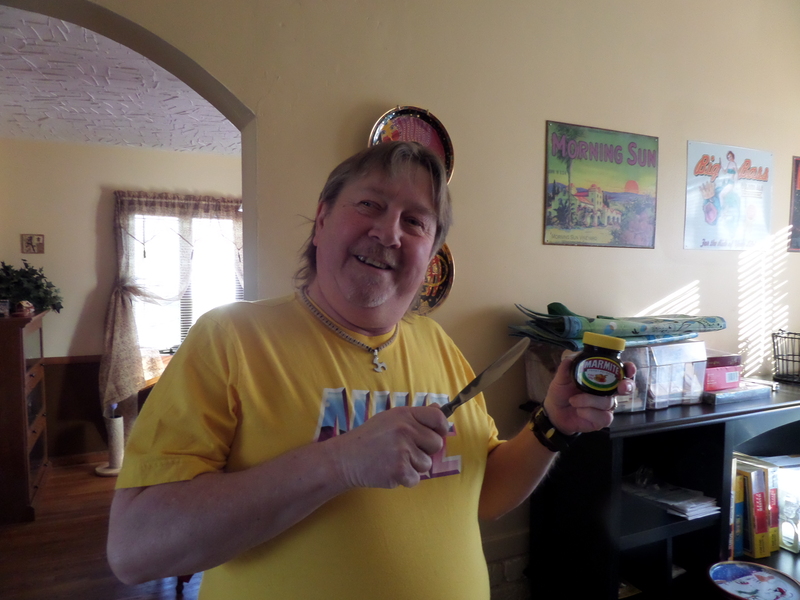 As you may know I am an Englishman living in Ohio and it seems that one of the things that Americans do not have nor understand is Marmite (they sadly do not have Vegemite either). Now it seems to me that the more you haven’t got something, the more you desire it. That is how it is me. Sometimes I dream of hot buttered toast spread with the deliciousness of Marmite eaten in front of a log fire preferably. I have seen Marmite here, but only in the speciality stores and by gum do they want some wedge for it. I must admit it was getting close to the point where I would gladly have sacrificed my children for a jar so it was wonderful to find a bottle of the brown nectar in my stocking yesterday. I have already christened my little jar enjoying some of its contents this morning with toast. I washed it down with a cup of Starbuck’s Tazo Joy tea. (another excellent prezzie from my baby). I am looking forward to trying the brown nectar again soon with Bagels, muffins, crumpets (mysteriously known as ‘Nooks n Crannies’ to the colonials) and in any other way I can think of. I thought I’d finish with some of the wonderful attributes of this heavenly nectar. 1) It is full of healthy vitamins such as the ‘B’ type ones. It is so healthy that people who live exclusively on Marmite and toast have been proven to live beyond 120 years of age. 2) Chuck Norris is a huge fan of Marmite and puts his superhuman strength down to eating at least one bagel a day spread with it. 3) It is a proven fact that it helps the libido. Cialis and Viagra are actually produced from Marmite. 4) It is now believed that it was spread liberally on the bagels by Jesus at the last supper. 5) The Greek word for ‘Food of the Gods’ is ambrosia. This is actually a mistranslation of Marmite. 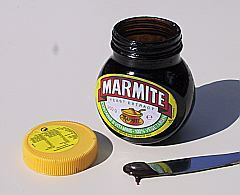 6) Spreading lashings of Marmite over the skin is proven to cure Acne, boils, and disfiguring scars within hours. 7) It is also known to vastly improve the IQ. Einstein admits he would never have found out that E=MC squared without his daily ration of yeasty loveliness. Anyway guys I am off for a little bit of toast with Marmitey Magic. Have a wonderful day. PS. Does anyone know where I can get Piccalilli in the colonies? © 2013 Stan M Rogers. All rights reserved. Faffy the Leprechaun. The Final Part. As Ben took a slug he heard the sound of small explosions. “What the feck!” he cried, looking suspiciously at his coffee mug. “No sorr, it isn’t der coffee. It’s Robert (Not Bob) dealing with the Fook Up Faeries.” Said Faffy. Ben and Faffy re-entered the warehouse. Ben’s nose prickled as it picked up the smell of … what was it he thought? Ahh yes, gunpowder. The place smelt like a bonfire night party after all the fireworks had been let off. Robert (not Bob) ambled towards them. At least the smell of explosives masked the smell of zombie thought Ben. “Eeeeee baa gum I did Faffy and stubborn little buggas they was too. Over thirty of them there were. A reet battle it was but I think I got them all.” Robert turned towards Ben. Robert held out his hand. He literally held out his hand. It had come off. His other arm just smouldered slowly in the space where the hand should have been. Ben got the stapler. He looked away as Robert (not Bob) performed surgery. “Eeee that’s better lad.” Smiled Robert waving his newly re-attached hand around. Ben sighed and leaving Robert behind he and Faffy returned to the dispatch department. Ben cringed as he heard Mad Mick shouting for him. “I’m here Mick. Shouted Ben sounding happier than he felt. Mad Mick agreed and returned to his office. Ben was speechless. He ran out through the warehouse. The DeVito’s had gone. Robert (not Bob) also had gone. He ran back into the dispatch department… Faffy had gone. The department seemed to have returned to normal. The Anglo-Irish document centre staff were working away normally preparing the next delivery. “Well I’ll be a monkey’s uncle.” Muttered Ben. Ben slept well that night and awoke feeling refreshed. As he drove into work he thought back to the previous day. It all seemed a little vague now. 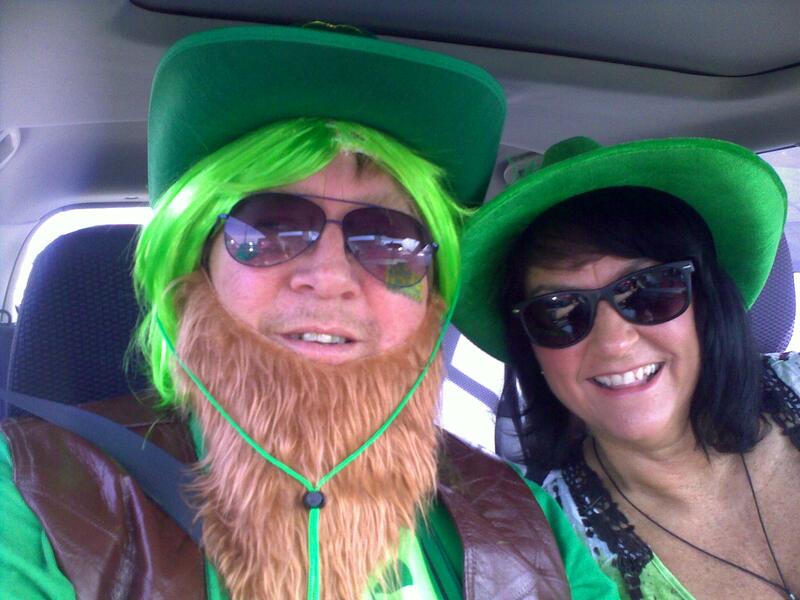 Leprechauns? Zombies? The DeVito’s? Ha! By the time he arrived at work he was convinced it had all been a dream and his suspicions were confirmed as he entered the Anglo-Irish Document Clearing Centre. All was as normal. His staff were chatting idly as they enjoyed a last swig of coffee before starting their days work. He grabbed a quick coffee himself from the canteen and settled down at his desk to read his emails. He sipped the coffee and was disappointed that as usual it tasted of mud with a hint of caffeine. He sat back in his chair and sighed. Just a dream. Oh well let’s start work. Lots to do. He thought sadly. He opened his desk drawer to find a pen. And grinned. Nestling in the drawer was a bottle. The label read. ‘Poteen’. He poured a large slug into his coffee. Faffy has been expanded and is now available as an ebook here. Only 99 cents too. Begorrah!